Made by Kerry, Charles H in Dorrigo, New South Wales, Australia, c. 1905-1917. Rich volcanic soils and relatively high rainfall make the Dorrigo Plateau in northern NSW perfect for dairy farming. European settlers arrived there in the 1860s but it was not until 1875 that dairying became really viable. In that year Thomas Mort and Eugene Nicolle developed refrigerated railway vans for milk, enabling dairy products to travel to distant markets. Glass negative, full plate, 'Packing Cream on the Dorrigo', Kerry and Co, Sydney, Australia, c. 1905-1917. Silver gelatin dry plate glass negative in landscape format. 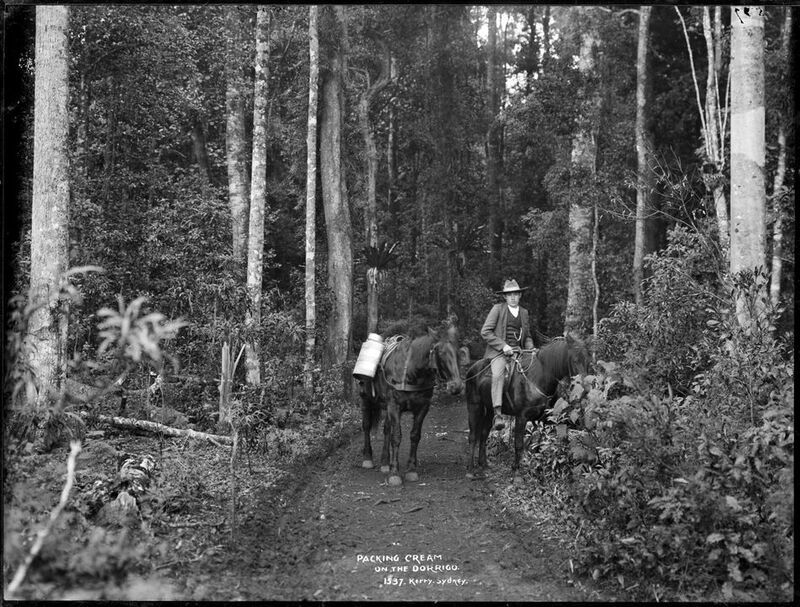 The image depicts a scene on a dirt track in the Dorrigo area of New South Wales. The dirt track is depicted in the centre of the image extending from the foreground into the background of the image. Two horses can be seen on the track in the centre of the image. Both of the horses are saddled and one is being ridden by a young man, he is holding the reins to the second horse which is laden with cream tins. The track is surrounded by forest vegetation including ferns, bushes, tall stands of trees and birdsnest ferns. The caption, studio number and studio mark are inscribed on the reverse of the negative. Inscription in plate emulsion verso upper left corner, scratched by hand '1537' and top right, scratched by hand 'Dorrigo'. In 1985 Australian Consolidated Press donated the collection to the Powerhouse keeping a set of copy prints for themselves. The collection at this time consisted of 7,903 glass plate negatives and 7,916 contact positive prints. Of these 493 glass plates were damaged but usable and 13 plates totally broken. A further 2,500 Kerry & Co. negatives are held in the Macleay Museum at the University of Sydney.